It’s easier to understand why South Carolina and other Southern States desired to secede and get away from ideologically-crazed crybully left-wing Abolitionists. The Civil War has been over for more than a century and a half. The North won. Slavery was abolished. The South was invaded, burned, conquered, occupied and forcibly Reconstructed. The Secessionists are dead, ask a college student about the Battle of Gettysburg and he’ll say: Huh? 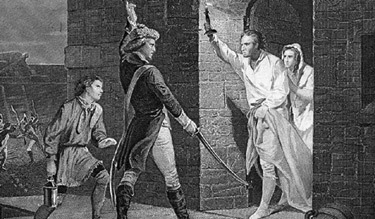 but today, the Left has resumed fighting. Monuments to Southern heroes are being removed, the Confederate Battle Flag (now, really just an amorphous symbol of undefined Southern geography, Redneck identity, or unfocused rebelliousness) is being outlawed, and even the high school in South Burlington, Vermont, land of Bernie Sanders, has become a New Civil War battleground. In 1961, when education leaders in South Burlington decided that a newly built high school should be nicknamed the Rebels, nobody batted an eyelash. After all, this community was founded when it split from greater Burlington about 150 years ago. Yet this city on the shores of Lake Champlain has never seen anything quite like the current revolt under way. 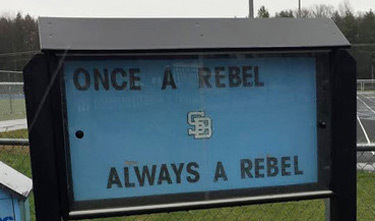 Three months ago, the Board of School Directors decided the Rebels moniker had offensive connotations and, therefore, needed to go. Those Vermonters who didn’t agree with the decision reacted like, well, Vermonters. To protest the decision, local opponents have twice helped vote down the nearly $50 million school district budget. Signs saying, “Be a Rebel. Vote No” dotted yards. Plans for a third vote on the budget are in the works. 4 Feedbacks on "Civil War Skirmishing in South Burlington, Vermont"
“Be a Rebel, Vote No!” Heh! Oftentimes having a great slogan is the route to success. Go on Vermont, take a stand against the politically correct urge to purge history. Is anyone else appalled at the removal of Civil War memorials? How is it different from the Taliban and ISIS destroying historical artifacts that offend their religion? Over here in NH, we almost give up on Vermont from time to time. A wonderful state until it was invaded by New Yorkers. Of course, we can’t much accuse anymore, as we were a wonderful state ourselves until we were partly (pray God only partly) taken over by Massachusetts. Good to hear the real Vermont is still under there, however much they try to smother it.